What Holds Back Your Performance? The first step to gaining maximum composure is to identify the mental breakdowns that cause you to become unraveled or lose emotional control in the big game or when under pressure. 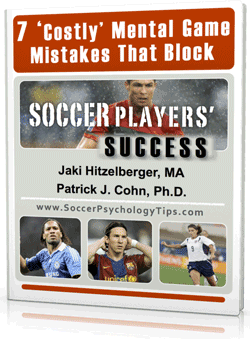 If a soccer player’s mental game foundation is weak, emotional composure will not be ideal. For example, a soccer player with very high expectations for his performance is likely to become easily frustrated, lose control emotionally, when he believes that those expectations are not being met. Below is a list of the top 8 mental errors that can hamper your composure. 1. Perfectionism — When you don’t perform perfectly you lose composure because you become frustrated and then focus too much on your mistakes instead of the tasks needed to perform well for the current play. 2. Worrying too much about what others think — Worrying too much or mind reading into how you think others may judge you distracts you from your performance. You lose composure because you are too concerned with how others may perceive your performance. 3. Irrational Beliefs – Irrational beliefs cause you to stay stuck in old, ineffective patterns of behavior. 4. Fear of Failure – Fear is based on your intense need to win and causes you to worry too much about losing or failing. This can lead to you playing defensive and tentative instead of composed and free. 5. Doubt and Lack of Composure – This happens when you doubt your abilities and undermine your confidence. 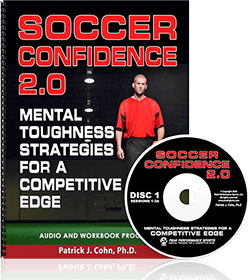 Without full confidence (for more information on Confidence, see Soccer Confidence, which is the first soccer specific mental training workbook and CD program), you are prone to lose composure and get upset. 6. Comfort Zones – This is an expectation about your performance that limits your potential. The comfort zone keeps you stuck in a performance zone or scoring barrier when you do not risk beyond your own comfort zone. 7. Intimidation – When you focus too much on the strengths of your opponents, you have the opportunity to become self-intimidated. And when intimidated, you worry too much about or focus too much on your opponents, especially if they are doing well in competition. 8. Dwelling on Errors – When you get too caught up in mistakes and dwell them, you’ll get frustrated and lose emotional control, which will not help you stay composed after errors. 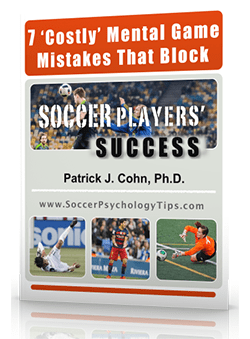 Hey, if you enjoy reading our mental game tips, please forward this link to other soccer players, coaches, or parents who would appreciate it.